Biking Around Town– this is one of the easiest cities in which to partake in a do-it-yourself bike tour. 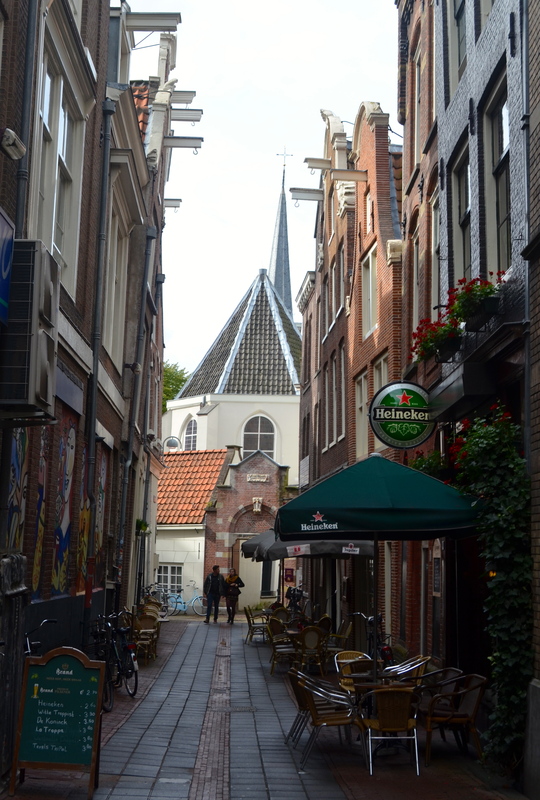 Central Amsterdam is a beautiful city to explore with all the little side streets and lopsided, ancient terraces. The trams are also excellent and a very affordable way to get around. Nobody needs taxis in Amsterdam. If you enjoy cycling, make like a Nederlander and get some wheels – there are several bike rental shops near Centraal Station and even more in Dam Square. Just look around and you will see one – the signs all say fiets (“bike”) and the average rental price is €8 – 10 per day. 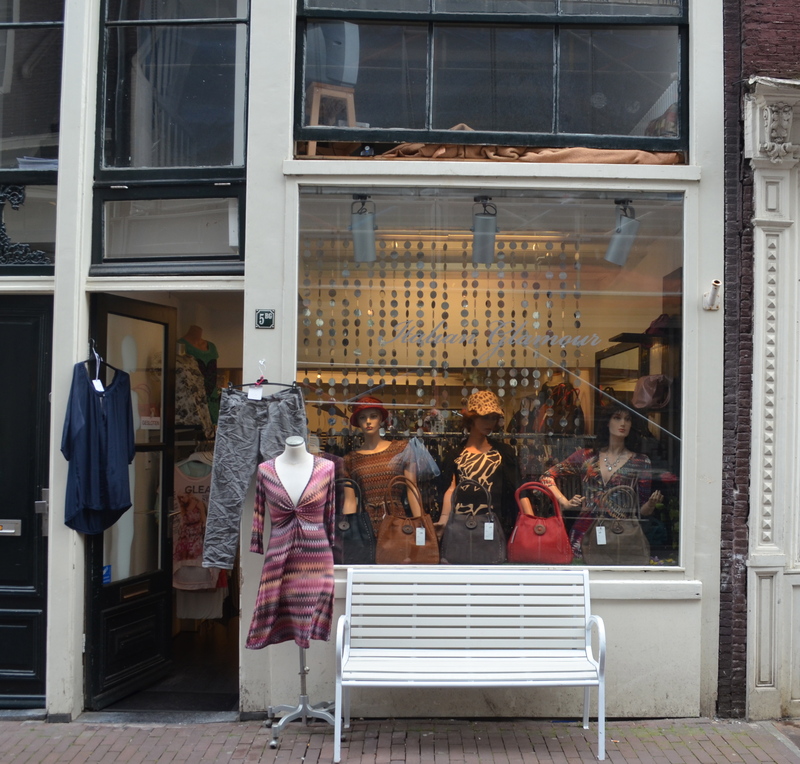 Shopping – Read this carefully and this will lead you to the best shops in Amsterdam. A few minute’s walk from The Royal Palace in Dam Square is The Nine Streets (9 Straatjes) in the Canal district. In this area you will find anything you could ever want to buy. Products from Holland and other parts of Europe are sold in these trendy little shops. Start on Wijde Heisteeg 9 to discover Lou Lou, a Dutch boutique with local and imported clothing, high-end dress jewellery and unique accessories. Two stores behind at Wijde Heisteeg 5 is a very special find: Italian Glamour. It doesn’t look exceptional from the outside but which amazing finds ever do? This store is run by a beautiful, gentle Turkish man called Attila who imports all the clothes himself from Italy – high quality silk, wool and fine accessories. To make it even sweeter, it’s all quite reasonably priced. I managed to get a woollen jacket and 2 silk blouses for €150. That’s almost unheard of these days. 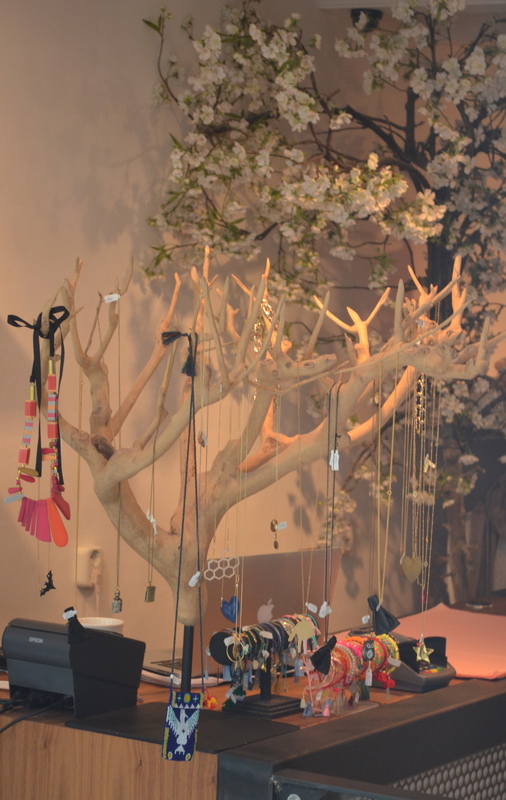 Around the corner from Lou Lou if you turn left you will find Knopenwinkel at Herengracht 389. Knopenwinkel means “button shop” and this beautiful shop, which is also a gallery, sells all manner of exotic accessories, art, furniture and antiques. As you may have guessed, Knopenwinkel also stocks quite a few buttons. Not your ordinary rubbish, really cool buttons: wooden, enamel, old, new, tiny, enormous. 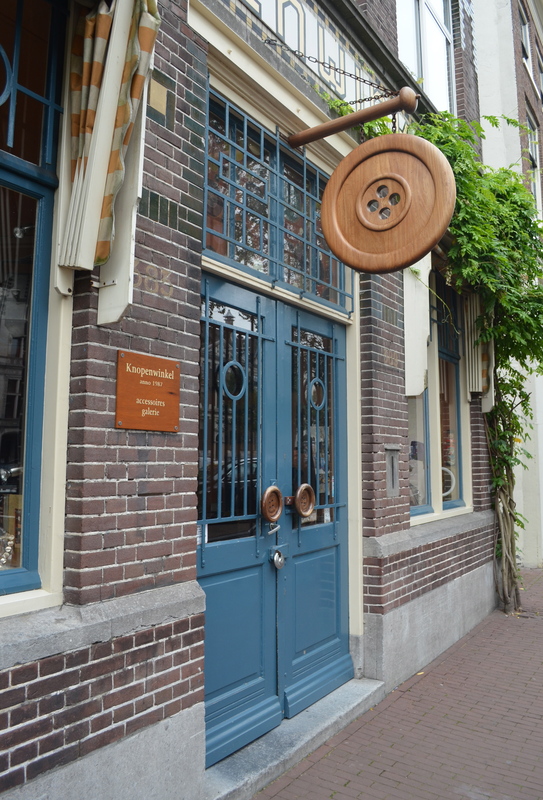 The reason for the founding of this shop is, according to their website, because “the button is back” – for all you silly people who didn’t know… to find Knopenwinkel just look for the giant wooden button. LockStock&Barrel at Hartenstraat 26 are purveyors of cool street wear for him and her – they source their brands from Belgium, Sweden and other exciting places. No trendy shopping district would be complete without a nomad textile gallery, right? The Nine Streets also brings us Shirdak: tribal rugs from the Miao minority of China; Robes from Uzebekistan; Felt slippers, bags, hats and jackets. The Kashmir boots designed by the shop’s owner are a particular favourite, made of traditional Indian Kashmir. They aren’t cheap but Shirdak’s products are made to last. 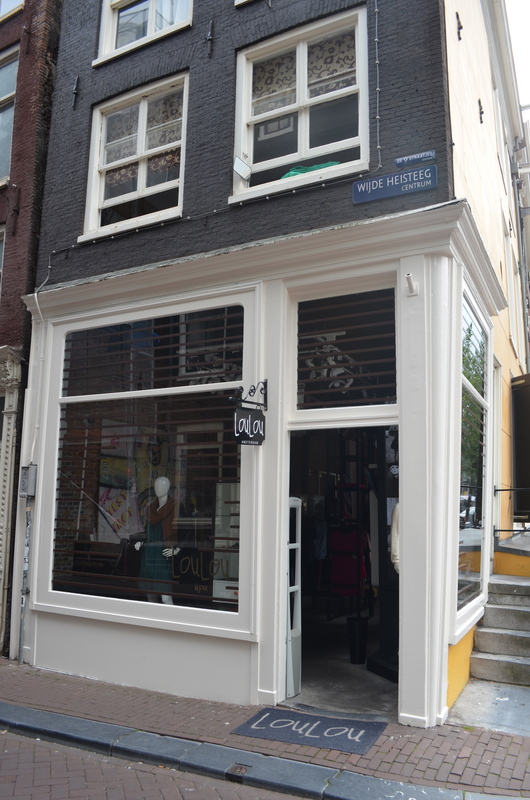 Every shop on Huidenstraat is dead cool. You’ll find a milliner’s, gentlemen’s outfitters… anything you could possibly need. Anne Frank House. Not too far from the shops is Amsterdam’s most famous museums. Anne Frank and her Jewish family hid from Nazi persecution in this attic for two years before being betrayed. Although the furniture of this Jewish hiding place from WWII was looted by the Nazis, The Frank’s presence can be felt in the house: Anne’s pictures are still on her bedroom wall, so is the the height chart that Anne’s father used to mark his daughter’s growth, knowing that his two girls would probably never live to adulthood. Visitors will also see the toilet they used, the original bookcase that concealed their secret annexe and, of course, Anne’s famous diary. Incredibly well preserved by Anne’s father, Otto Frank. The tour includes videos and interviews clips of Anne’s family and friends. The tragic details of Anne’s last days in a concentration camp, complete with documents, are on display. If you haven’t read The Diary Of Anne Frank then do grab a copy before you visit. One hopes that such barbarity would never happen again if everyone had a chance to visit Anne’s house. Buy your tickets online to assure a place, this is an extremely popular tourist site. See www.annefrank.org for information on visiting the Anne Frank House and Museum. Dinner should be had at Piet de Leeuw steakhouse on Norderstraat, close to Anne Frank’s House. Since 1949 Piet de Leeuw have been serving Amsterdam’s favourite beef and horse steaks. If you aren’t into cows and horses, they have outstanding fish dishes and desserts. Also, it’s a fun place to have dinner, people are chatty and you’ll certainly make a few friends here. This is simple, local fare but everything is of high quality: fresh salads, the best meat, homemade sauces and generous desserts. Reservations online are accepted and recommended – we turned up on a Wednesday evening and waited 20 minutes before finding a table to share, so booking is best. 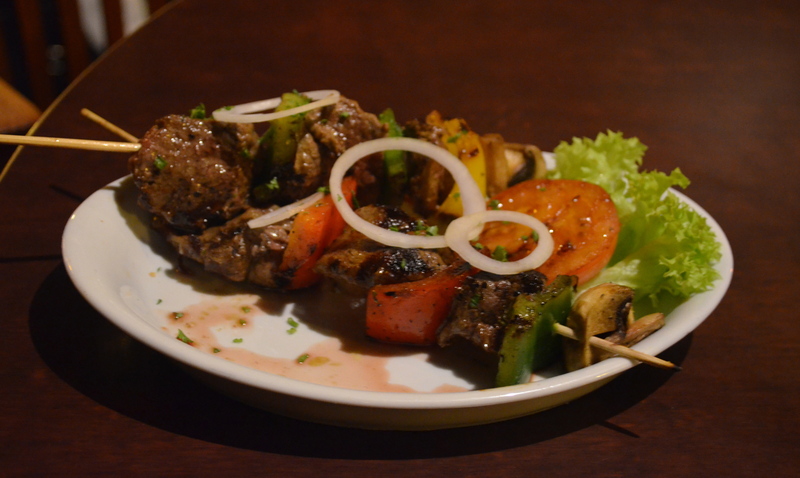 One skewer is horse, the other is beef – but which is which? Drinks – Amsterdam certainly has an abundance of bars. My favourite one was a tiny little establishment off Dam Square called Cafe De Dam or Louis’ Bar (Damstraat 4, next to the shop with the giant clog out the front) It’s tiny, cosy, cute and the staff are sweet. For such a tiny little bar they certainly have an extensive menu. You’ll meet the most interesting people in town right here. Try the hot mulled wine, or gluhwein, it’s excellent. Cafe De Dam is open till late on weekends. 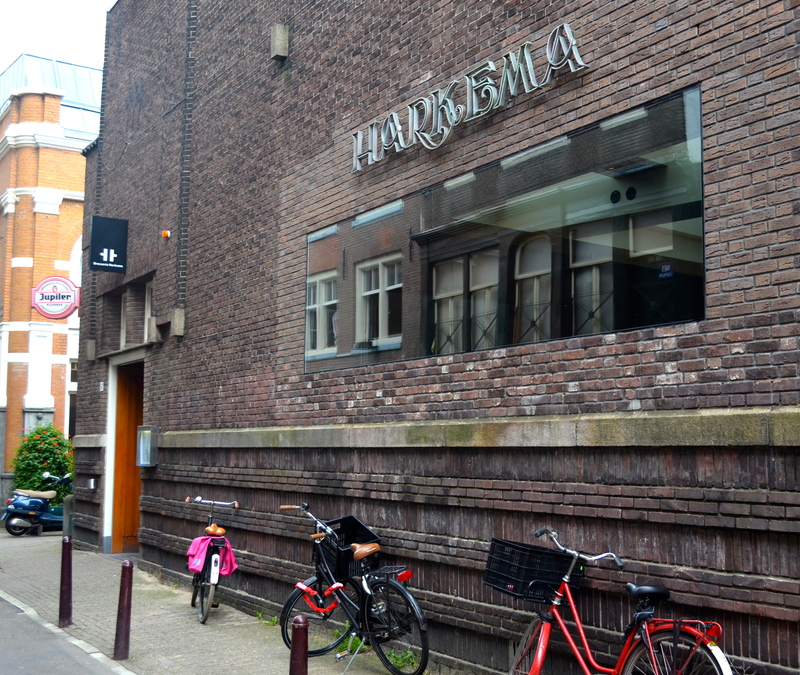 A place that I think is ideal for both eating and drinking is Harkema on Nes 67, a bar and brasserie housed in an old tobacco warehouse. 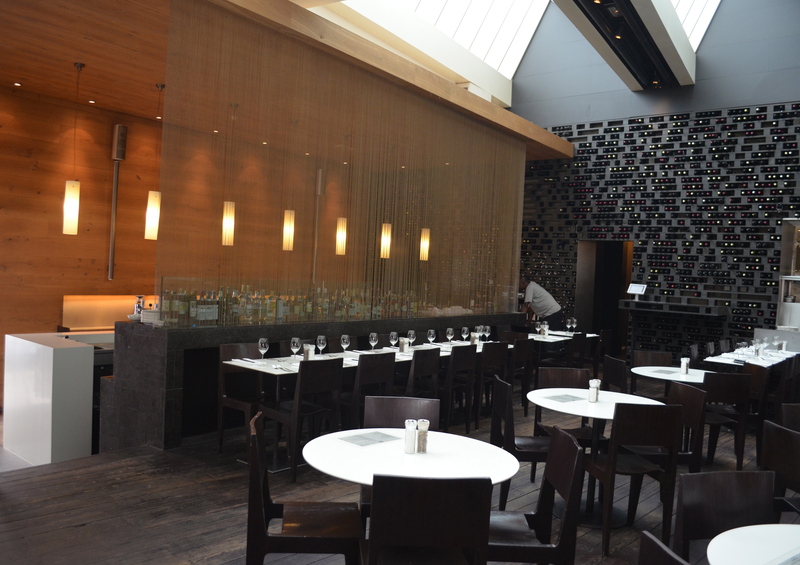 A stylish decor, fabulous wine list, reasonably priced meals in enormous portions makes this place a very attractive option. Dutch fare such as steak and croquettes are offered along side Asian fusion appetisers. Several vegetarian dishes are also available. The main dishes come with fries and a salad so large that they require their own plate. If portion size is important to you, then you’ve found the right place. Harkema is open from 11am till 11pm – just look for the warehouse opposite the theatre. 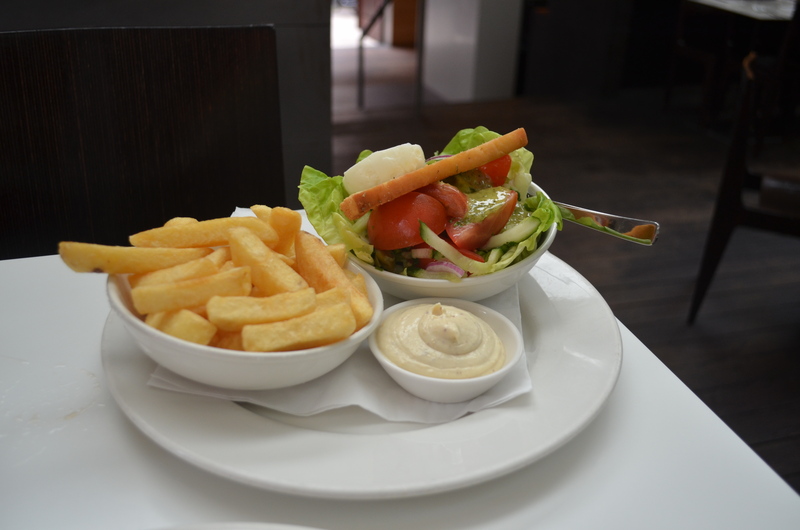 Brunch and lunch is about €4 – €10 each, Dinner is around €17 for a main and a glass of outstanding Merlot is €4.80. Although it closes at 11pm, there are plenty of places to go if you want to party on after dinner. Hotels with a bit of personality abound in Amsterdam. Stumbling distance from Dam Square is Hotel V – it’s gorgeous with it’s retro decor and fun lobby bar. The best thing about Hotel V is the location – 8 minutes walk from Amsterdam Station, 2 minutes walk to the canals and Spui tram stop. There are a lot of cool places near by, including loads of Amsterdam’s famously lopsided, seriously skinny houses – take your camera out and explore. One of my favorite cities! Must revisit with your fab guide; only other tip I’d include is having rijstaffel. Thanks Linda! I saw rijsttafel but didn’t bother as it surely can’t be better than a nasi padang? I love hearing about things to do in Amsterdam other than cannibis cafes! Thank you! It gets a bit tired, doesn’t it? I don’t think I’ve ever been in one. Love these ideas to make the most out of 24 hours. 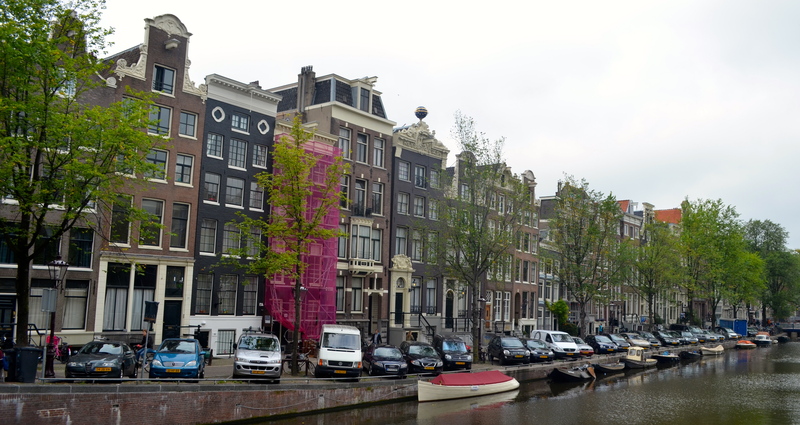 There’s alot to do in Amsterdam and it’s a very walkable city!